To the cry of the people means to the cry of the people Israel. In the land, means in the land of Israel. The oppression referred to means the last stage of the conflict between Israel and Ishmael, the stage that is to occur in the times just before time of the Messiah. 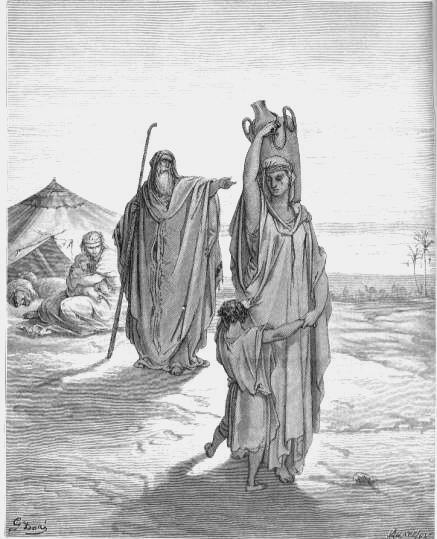 The conflict between Israel and Ishmael begins in biblical times when the patriarch Abraham sends away his concubine Hagar with her child Ishmael. Why does he send them away? Because Sarah has paid attention to what Ishmael is doing with Isaac. She sees that he מצחק, taunts or mocks, Isaac (Genesis 21:9). On the one hand, as explained by Rabbi Hirsch, Ishmael makes fun of the religious teachings that Abraham is teaching his son Isaac. He [Ishamel] took in just as much of the great ideas of Abraham to make him ironically disdain them, and over that which the world in general greeted merely with laughter in which derision was only lightly mixed. The Pentateuch Genesis, Samson Raphael Hirsch, Isaac Levy trans., Judaica Press, Ltd, Gatehead 1989, p. 354. On the other hand, the term מצחק is used in several other ways in scripture: idolotry (Exodus 32:6); fooling around, jesting (Genesis 19:6); sexual play between man and wife (Genesis 26:8); adultery (Genesis 39:17); and murder [where the צ is exchanged for a ש] (II Samuel 2:14). Let us go and see our portions in the field. From this we conclude that Ishmael not only made fun of Abraham, his father's teachings, but that he as well attempted sexual play with unmarried and married women, that he engaged in practices of idolotry, and that he attempted to murder Isaac by what would seem like a chance accident with bow and arrow.